AP Photo/Phelan M. Ebenhack Dwight Howard is happy with his help now. But will he feel the same when he's a free agent in 2012? It is the natural progression in these wildly speculative times. The leaguewide obsession with LeBron James' future almost instantly gave way to a similar fixation with Carmelo Anthony's and will inevitably result in every-day discussion that centers on the Orlando Magic's ability to hang on to the game's best big man. Chris Paul and Deron Williams aren't the only marquee names headed for free agency in the summer of 2012. That's the same summer when Dwight Howard will have the right to opt out of the final year of his contract and move to a more glamorous city. It's the nightmare scenario we know is already spooking the Magic, given how swiftly and thoroughly they traded in most of Howard's supporting cast when the season started badly, not even waiting until Christmas to swing two Dwight-sized deals. All of Orlando has seen this haunting movie before. The Magic know what's out there, too. They're well aware of the rumbles in circulation that Howard secretly longs to make the same cross-country trek to Los Angeles that Shaquille O'Neal mapped out in 1996, with one source close to the situation insisting that Howard and Lakers star Kobe Bryant are far closer pals than people realize. Another source very familiar with this landscape insisted this week that the New York Knicks -- another major-market team that can deliver the visibility Howard craves -- will also factor strongly in his thinking when he hits free agency. The only way to hush such talk, of course, requires the Magic to go three wins farther than they did in 2008-09 and win it all, preferably as soon as this June. Howard naturally isn't speaking in such absolutes publicly, but he did offer a few telling glimpses into his thinking in a recent chat with ESPN.com, during which he weighed in on Orlando's overhaul and stressed that rings will impact his long-term decisions more than anything ... while also sharing a provocative thought or two about Blake Griffin's emergence as the NBA's new darling of the dunk. Stein: How much better are you feeling about things since the big trades? Howard: I'm a lot happier than I was. I think everybody hates to lose, but the way we were losing, it just didn't seem right. And I thought things needed to change around here. I hated to see those guys go, but I understand what needs to take place for our team to go to another level. I just felt like everybody had counted us out and we were just going to become a team that might make the playoffs. And I didn't want that to happen. I knew I had to step my game up and I knew that we might need some change. Stein: But when the trades were first made lots of people didn't seem that impressed. A lot of folks still think this team has holes and is too small -- excluding you, obviously -- to win it all. 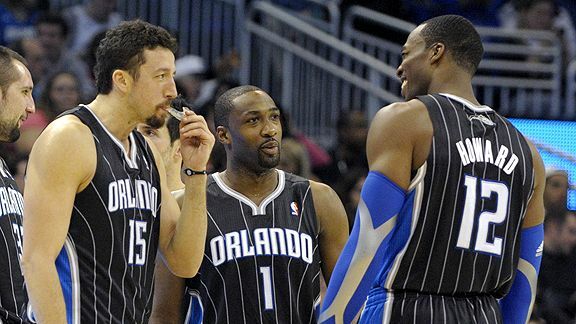 Howard: The biggest thing that people forgot about was that we added three guys who are playmakers, guys [Gilbert Arenas, Hedo Turkoglu and Jason Richardson] who know how to get their own shot but also create for others. You bring a guy in like Hedo, who can play [four positions], there's not a lot you can do with that matchup right there. And he knows the system. I think we are fine. We got all the right pieces. I think it just starts and finishes with the way I play, the way I approach every game. We know Boston is going to be tough. They do have a lot of bigs. But we understand what's going on. It doesn't matter how tall you are. If you play hard, that height that we're giving up is put away. And like I always tell people, you can't just match up for one team, 'cause you never know who you're gonna play. Stein: Did you personally go to management and ask them to bring in Gilbert [Arenas] or did they ask you if you were OK with it? Howard: No. I found out when everybody else found out. It wasn't like, "Hey, I want these guys. I want these pieces." I woke up from a nap and there were changes. Stein: Everyone talks about all the work you did on your post moves with Hakeem Olajuwon, but can you clear up how much credit we should really be giving him for your [offensive] improvement? Howard: I worked with Hakeem for three days. But I could go work with Michael Jordan and I'm not going to be Michael Jordan, so it didn't really matter who and how long I worked with somebody. The other things ... spending extra time in the gym, going to the gym every night and making a thousand shots before I leave, every time I went overseas [to China, India and Africa] -- whatever I did -- I finished [the day] with working out in the gym and working on everything. And then just having the confidence to do it in a game. I will give Hakeem and [Magic assistant] Patrick [Ewing] credit for helping me get to where I'm at, but it's hard work. I put in a lot of work to get to where I'm at. Stein: When you walk around town, do people ask you if you're going to leave town someday like Shaq did? How often do people ask those kinds of questions? Can you feel that people in Orlando are worried about history repeating itself? Howard: I want to win a championship. And I'm going to do whatever I can to win the championship here in Orlando. This is where I started my career and I would love to finish my career here. Stein: I ask that because all of us know-it-alls [in the media] think that the Magic made these trades because they're worried about keeping you. Howard: Did they make the moves to keep me happy? I don't know. The only thing that's going to keep me happy is winning -- winning a championship. I always have to do what's best for me at the end of the day. [But] like I said, I'd love to finish my career in Orlando. Stein: So who's your pick to win the dunk contest? Howard: I mean, it's obvious who should win. But I think when people watch the dunk contest this year, they shouldn't expect to see something that they've never seen before. I think that's what people [expect] in the dunk contest now. In 2011, there's not that many dunks that have not been done before, unless Blake [Griffin] goes out there and does a 920, which is physically impossible. Stein: Is it fair to say his dunks impress you? Howard: Uh ... in-game dunks, yeah. I've never seen him in a dunk contest, really. But the way people want to see the dunk contest now, you have to be super creative. But if he wants some help, I got five dunks nobody's ever seen before. Stein: Will we ever see you on the dunk-contest stage again? Howard (laughing): I'm done. I'm done. Stein: Sounds like at least a little part of you feels slighted by the fact that people are making such a fuss about what a great dunker Blake Griffin is for a big man. Does that bother you a little bit? Howard: It does. But, hey, he's hot right now. And when you play in L.A., on the biggest stage in the world, people are going to see you more. So I'm happy for him. But if he wants some help with dunkin', I'm here. I'm the man. "All this talk about him kind of transitioning is a lot of bull----." Dallas Mavericks coach Rick Carlisle, scoffing at the notion that Tim Duncan's diminished numbers with the San Antonio Spurs should be interpreted as conclusive evidence that the 34-year-old is in decline. 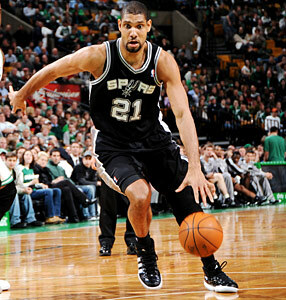 Duncan was indeed averaging just 13.7 points and 9.2 rebounds in 29.4 minutes per game -- all of them career lows -- entering Friday's showdown at home against Carlisle's Mavs. By now, though, you're surely aware of San Antonio's new game plan: Speed up the game, keep the ball moving and curtail the regular-season demands on Duncan -- reducing his touches even when he's on the floor by making Manu Ginobili and Tony Parker the offensive focal points -- to keep as much gas as possible in Duncan's tank for the postseason. The way Carlisle continues to refer to Duncan as "a premier player" would suggest that, as stated in Box 4, no one should be surprised if this Duncan is voted on the West All-Star squad by the coaches who admire him so. The notion that the Washington Wizards are open to moving fourth-year guard Nick Young before the Feb. 24 trading deadline is fading. With speed. The Wiz presumably have no untouchables on their roster beyond prized rookie John Wall when they're sporting a road record of 0-19, leaving them just one away loss shy of becoming the sixth team ever to start a season 0-20 on the road. But at least one interested suitor, noting that Young has arguably been Washington's best player since the pre-Christmas deal that sent away Gilbert Arenas, said this week that the Wiz sound intent on keeping him. The most recent evidence of Young's rise came Tuesday night, when he drilled Sacramento for 43 points in Washington's 136-133 OT win to become just the fifth Wizard since Michael Jordan's retirement to post a 40-point game. The other four (Caron Butler, Antawn Jamison, Larry Hughes and Arenas) are all now former Wizards. Just as Brendan Haywood's departure to Dallas in the Butler trade created more minutes and opportunity for JaVale McGee, Arenas' exit has given Young newfound license to shoot the ball liberally. Questions persist about Young's defense, feel and decision-making, but he has an enviable reputation as a shot-maker. The Wizards, according to NBA front-office sources, are also getting calls on veteran guard Kirk Hinrich and are said to be more amenable to moving the former Bull -- Wall's supposed mentor -- than dealing Young. Wiz forward Andray Blatche, as you've heard since Christmas, can obviously still be had, too. 0: Orlando had never lost a regular-season overtime game in nine tries under Stan Van Gundy before Wednesday's defeat at New Orleans, when Dwight Howard missed two free throws with 11.6 ticks left. Van Gundy's only previous OT losses as Magic coach came in the 2009 NBA Finals against the Lakers: Game 2 and Game 4. 0: Dwyane Wade has yet to win a game in Denver in seven attempts as a pro after the LeBron James-less Heat got routed Thursday night by the Nuggets. Denver is the only NBA city where Wade has never won a game. 7: DeShawn Stevenson has emerged as one of the surprises of the season by making 47.7 percent of his 3-pointers for Dallas ... but a player discarded by the Mavs during the 2008-09 season and out of the league for more than a year has been even more surprising. By draining seven of eight attempts from long distance in Wednesday's loss at Utah, New York's Shawne Williams raised his league-leading percentage on 3s to .589 at 33-for-56. 1: Wednesday's five-point loss at Charlotte marked the first time this season that the Chicago Bulls were beaten after leading through three quarters. Chicago had been 18-0 in that situation. 5.2: Before getting hurt in Wednesday's loss to the Los Angeles Clippers, LeBron James was averaging a league-leading 27.9 points in road games this season ... 5.2 points per game higher than his scoring average (22.7 ppg) in home games. The Detriot Pistons, sources say, are already fielding calls from teams interested in floor-stretching big man Troy Murphy. The lefty isn't even a Piston yet, but the rumbles have already started about Murphy attracting the interest of numerous contenders (Orlando, Dallas, San Antonio and more) if he does end up in Detroit as part of a Carmelo Anthony deal. The Pistons, though, are telling teams that they can't buy Murphy out of his contract to make him a free agent because of financial restrictions stemming from the pending sale of the franchise, which has also limited Detroit's ability to consider anything other than money-shedding trades in recent months. Will a follow-up trade materialize to land the lefty with a contender and satisfy the Pistons' budget constraints? That's what Murphy -- still waiting to taste the playoffs after a record 639 regular-season games without a trip to the postseason -- is hoping. There's some optimistic news for those of you hoping Minnesota double-double machine Kevin Love can get into the All-Star Game even though he plays for a team that has barely cracked double digits in wins. I've been reasonably assured that Love -- who's obviously not a center -- is big enough as a big man with his irresistibly massive statistical output and efficiency to make it onto the list of potential fill-in selections when NBA commissioner David Stern has to choose a West roster replacement for the injured Yao Ming. Competition for Yao's spot is still going to be pretty stiff when you figure that West coaches could well run out of room with their seven reserve selections for the likes of San Antonio's Tim Duncan (fifth in fan voting among West forwards) and one or both of the Lakers' frontcourt regulars: Pau Gasol (third among West forwards) and Lamar Odom (seventh). Even if the coaches can't resist this saving-it-for-the-playoffs Duncan as many suspect -- and even if Carmelo Anthony is dealt to an Eastern Conference team to move Pau into a starting spot in fan balloting -- it's almost a given that Odom will be bypassed by the coaches and thus pop up prominently on Stern's Yao list alongside Dallas' Tyson Chandler, who continues to be ranked on this scorecard as the most effective center in the West through the season's opening half. There will likewise be calls -- without even acknowledging productive Westerners such as LaMarcus Aldridge, David West, Paul Millsap and Zach Randolph -- for Blake Griffin from the hometown Clippers to take Yao's spot, despite the fact that (A) vets always trump rookies in All-Star matters and (B) Griffin has already been lined up to carry All-Star Saturday as the headliner of the dunk contest as well as Friday night's rookie game. The optimism from rival teams circulating this week about the Los Angeles Clippers making 2010 All-Star Chris Kaman available before the Feb. 24 trading deadline -- thanks to the fast-moving rise of Blake Griffin's buddy DeAndre Jordan -- was not debunked Thursday by a source familiar with the Clips' thinking. But there is a disclaimer: L.A. is saying, at least for now, that it is likely to keep Kaman through the deadline unless moving him results in a clear upgrade at small forward. An upgrade with a reasonable contract, that is. That presumably rules out a move for the long-term deals of Philadelphia's Andre Iguodala or Charlotte's Gerald Wallace. Detroit's Tayshaun Prince, with an expiring contract valued at $11.1 million, fits the Clips' parameters better, but the Pistons -- despite their longstanding fondness for the former Central Michigan center -- could well lack the financial flexibility they'd need themselves to take in Kaman (owed $12.2 million in 2011-12) until the sale of the team goes through (as mentioned in Box 3). One of the other factors that makes things tricky: Kaman has been sidelined for all but 10 games this season by a badly sprained left ankle and the Clips would prefer to see how a Kaman/Jordan/Griffin frontcourt rotation looks at full strength before deciding Kaman is superfluous. The Clips, though, might not get much evaluation time before the deadline arrives, which means they'll have a tough decision to make if Kaman continues to attract outside interest whether he's fully healed or not. What's clear is that Jordan's in-house stock has risen dramatically and that maintaining the financial flexibility to re-sign him, with restricted free agency looming in July and the threat of big offer sheets that they'd have to match, is high on the Clips' to-do list. The fact that Jordan and Griffin got so friendly over the summer -- with the added benefit of lifting Jordan's on-court productivity -- only makes keeping them together more of a priority. 2: Two more points Tuesday night against Cleveland and the Los Angeles Lakers, according to the Elias Sports Bureau, would have become only the second team in NBA history to score at least twice as many points as its opponent. Indiana did it in a 124-59 victory over Portland at Market Square Arena in February 1998; L.A. fell just shy in its 112-57 dismantling of the Cavs. 2: The Minnesota Timberwolves' Kevin Love is the first player to post two 20-20 games against San Antonio in the same season since Moses Malone, who had two each for Houston against the Spurs in the 1977-78 and 1978-79 seasons. 45: The Golden State Warriors' Andris Biedrins has attempted just 45 free throws in 62 games the past two seasons ... and has unfathomably converted only nine. 3: Russell Westbrook's 32 points, 13 assists and 10 rebounds in Thursday night's one-point home win over Orlando accounted for the first 30/10/10 game for the Seattle/Oklahoma City franchise since Gary Payton had one late in the 1999-2000 season and just the third this season (Kobe Bryant and LeBron James had the first two.) Westbrook now has four career triple-doubles; LeBron leads the league with 14 since Westbrook's NBA career began in 2008-09. 48: The Phoenix Suns' Steve Nash, by sinking his last 48 free throws, has nudged past the retired Mark Price to take over the NBA's all-time lead in free-throw percentage based on a minimum of 1,200 career free throws made. Nash's lifetime percentage stands at .9040 (2711-for-2999), compared to Price's .9039 mark (2135-for-2362). The league office has confirmed to ESPN.com that the Denver Nuggets do have the license to grant New Jersey Nets officials a face-to-face meeting with Carmelo Anthony before a trade is consummated. The Nets would want such a meeting to personally lobby Anthony to agree to a three-year, $65 million extension as part of the deal but there would be no tampering violation, league sources confirmed, as long as Denver gives New Jersey that permission. ... It hasn't made it any easier for Denver or New Jersey to find a fourth team willing to take on Al Harrington's contract, but the final two years of the deal actually feature partial guarantees. Although there are four years and $27.7 million left on Harrington's pact after this season, only $7.4 million of the $14.8 million he's scheduled to earn in 2013-14 ($3,574,300) and 2014-15 ($3,804,900) is fully guaranteed. ... After his recent audition with the Memphis Grizzlies, Flip Murray decided not to continue waiting for an NBA offer and accepted a deal with Turkish power Efes Pilsen for the rest of the season. Confirmation came Friday from Cleveland-based Mark Termini Associates that Murray is headed to Istanbul to play for Efes Pilsen -- which has reached the final 16 of the Euroleague -- after bypassing a non-guaranteed offer earlier this season from guard-stacked Golden State and feelers from other European and Chinese clubs. The 31-year-old averaged 9.9 points in 75 games last season for Chicago and Charlotte. Wouldn't even try to pretend to claim that I could deliver something in the zip code of the Martin Luther King column our own Michael Wilbon supplied earlier this week. All I can do, to help further the conversation on one of the most important days on the NBA's calendar, is supplement Wilbon's history lesson and perspective with some historical data to get you ready for the NBA's 13-game MLK Day menu on Monday, which includes an ESPN game (Chicago at Memphis at 1 p.m.), one on NBA TV (Sacramento at Atlanta at 4 p.m.) and two at night in a TNT doubleheader (Orlando at Boston and Oklahoma City at L.A. Lakers). First black player drafted by an NBA team: Chuck Cooper was selected by the Boston Celtics in the second round of the draft in 1950 heading into the league's fifth season. Earl Lloyd was drafted by the Washington Capitols in the ninth round and Harold Hunter was drafted by the Washington Capitols in the 10th round. First black player to sign a contract: Harold Hunter with the Washington Capitols on April 25, 1950. Hunter, however, was cut in training camp. Nat Clifton signed with the New York Knicks on May 24, 1950. First black player to play in an NBA game: Lloyd with the Washington Capitols on Oct. 31, 1950. The Capitols' season opener came one day before Cooper's in Boston and four days before Clifton's in New York. Cooper's debut with the Celtics also coincided with the Boston bows for point guard Bob Cousy and coach Red Auerbach. Hank DeZonie of the Tri-Cities Blackhawks became the fourth black player to play in the 1950-51 season, which started with 11 teams and was reduced to 10 on Jan. 9, 1951, when the Capitols were disbanded and their players were assigned to other teams. The Rochester Royals beat the Knicks for the championship, winning the NBA Finals in seven games with no black players or coaches. First black All-Star: Donald Barksdale in 1952-53 with the Baltimore Bullets. First black player to win an NBA title: Jim Tucker and Lloyd with the 1954-55 Syracuse Nationals. First black MVP: Bill Russell in 1957-58 with Boston. First black head coach: Celtics player/coach Russell in 1966-67. First black head coach to win an NBA title: Russell as player/coach in 1967-68 with the Celts. First black head coaches to meet in the NBA Finals: Golden State's Al Attles versus Washington's K.C. Jones in 1975. First black GM: Wayne Embry in 1972-73 with the Milwaukee Bucks. First black majority owner: Bob Johnson was granted the Charlotte franchise that he would eventually name the Bobcats on Jan. 10, 2003. Tim Legler and host Kevin Connors check in from the "NBA Tonight" desk to weigh in on Marc Stein's latest edition of the weekly NBA Power Rankings, which are updated every Monday. If Devin Harris winds up in Denver as part of New Jersey's long-running attempts to complete a blockbuster deal for Carmelo Anthony, don't completely dismiss the idea that Harris could land back in Dallas with the team that drafted him in 2003. Don't dismiss it because the Mavericks themselves haven't ruled it out. Harris is by no means seen as an ideal trade target by Mavs officials, since they were the ones who initiated the deal with New Jersey in February 2008 for Jason Kidd and given the fact that Dallas needs wing scoring and long-ball threats in the wake of Caron Butler's season-ending knee injury far more than they need another point guard. Sources with knowledge of the team's thinking confirmed to ESPNDallas.com that the prospect of making a trade pitch to bring back Harris has been discussed internally and will inevitably be broached with the Nuggets if the 2009 All-Star ends up in Denver. • For the full ESPN Dallas post, click here.